You'll see a wide diversity of the Greater Los Angeles population fishing on the Santa Monica Pier, both for recreation and for food. 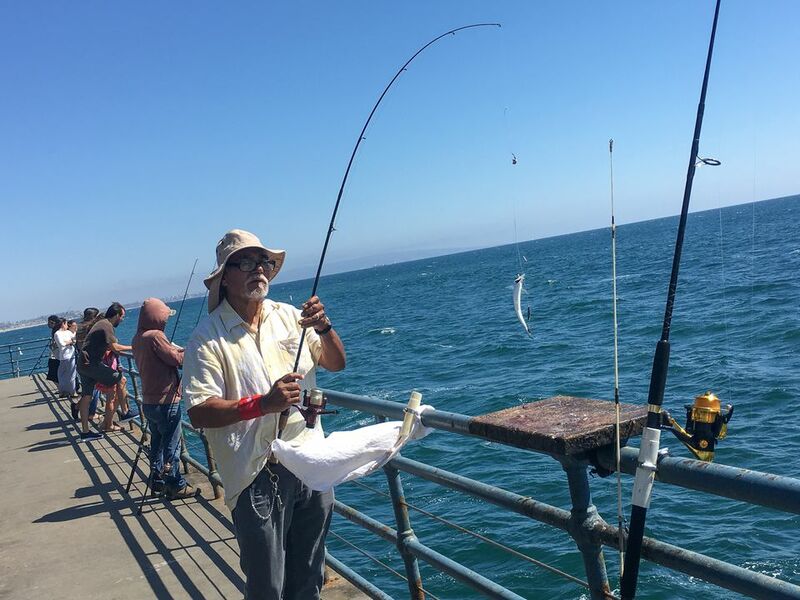 Here are some answers to frequently asked questions about fishing from the pier in Santa Monica. Whether or not you need a license to fish is the most common question about fishing on the pier. The answer is no: a license is not required. In fact, you can fish from any public pier in California without a fishing license. If you fish from the beach or a boat, however, then you would need a permit. There are some people who fish from the upper level at the Santa Monica Pier, but there is a separate fishing deck that wraps around the far end of the pier below the amusement level. You can access it from a stairway at the very end of the pier. There is also a ramp along the north side of the pier. If you're a novice at fishing, it's probably best to start on the lower level of the pier. You can rent poles and other fishing necessities at a bait and tackle shop at the far end of the pier. Be advised that although the pier doesn't have specific opening and closing hours, Pier Bait and Tackle is a private company. It's best to call ahead to make sure they'll be open when you need to visit. The most common fish caught off of the Santa Monica Pier are perch, mackerel, white sea bass, leopard shark, tiger shark, and stingrays. The black sea bass is endangered, however, so if you catch one, you must either throw it back or donate it to the nearby Heal the Bay Aquarium. Occasionally, more experienced fishermen and women may be able to catch barracuda, white seabass or even yellowtail, but these are usually found out at the end of the pier in deeper waters. For up-to-date advice on fishing the pier during your visit, check with the guys at Pier Bait and Tackle to see what's biting. Can You Eat the Fish You Catch? If you're thinking about eating the fish caught at Santa Monica Pier, the California Office of Environmental Health Hazards keeps a list of Fish Safe to Eat from Santa Monica Bay and along the coast. There may be signs posted on the pier listing fish that are not safe to eat due to mercury and other contaminants. In general, fish that should never be eaten when caught from the Santa Monica Pier include barred sand bass, white croaker, barracuda, and black croaker. Where is the Santa Monica Pier? Tips for getting there and parking.